Bluestem Communities’ volunteers were the guests of honor at the 2018 appreciation luncheons hosted on April 16 and April 17 at Water’s Edge. In 2017, Bluestem volunteers put in over 22,000 hours of work. “Our volunteers display such heart and passion for the mission of Bluestem Communities. We want to honor them for their selfless dedication to serving our residents and communities,” said Rachel Bucklin, community outreach coordinator. 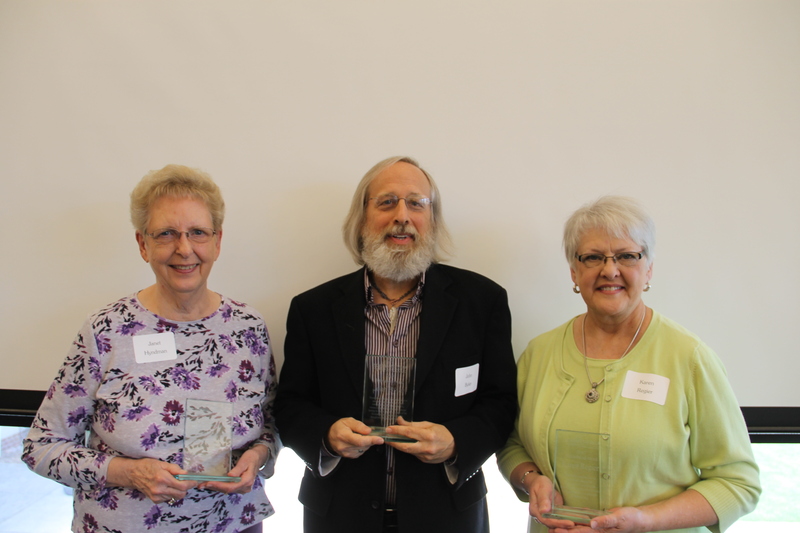 At the Kidron Bethel Village luncheon, awards were presented to three volunteers who have shown outstanding dedication to the core values of Bluestem Communities. Fred Schroeder was given the Making a Difference Award for his cheerful assistance with games and other activities in assisted living. The Innovation Award was presented to Gary Voth, who has developed new ideas and contributed to the social life of residents. Harold Wiebe was chosen to receive the Servanthood Award. Harold has brought fresh flowers to Kidron for residents to arrange for over two years. His servant’s heart and dedication has touched not only residents but staff as well. Awards were also presented to several Schowalter Villa volunteers. The Making a Difference Award was given to Janet Hyndman, who volunteers in multiple roles at Schowalter Villa. Her energy and passion has touched many lives and appreciated by all. John Byler was presented with the Innovation Award. Byler hosts several reading groups for residents who can no longer see to read for themselves. Karen Regier was given the Servanthood Award for her ability to relate to others with dignity and compassion in all of the many areas she volunteers in at Schowalter Villa. More than 750 people live at Bluestem’s Life Plan Communities in North Newton and Hesston. Numerous residents are active in the on-campus volunteer program, as well as serving in the greater community. The public is invited to share their time and talent with residents of Bluestem Communities or become members of their auxiliary-support organizations, Friends of Kidron and Villa Partners. For more information about volunteering at a Bluestem community, contact community outreach coordinator Rachel Bucklin, 620-327-3497, rachelb@bluestemks.org.